As part of the ever continuing Satellite range, Toshiba have released the P855-32G - a high end 15.6" notebook, priced in the £650 bracket. Finished in an expensive looking aluminium surround, it features an Intel Core i5 - 3210M processor, 8GB of DDR3 RAM, as well as a 1TB hard drive operating at 5400RPM, all running on the excellent Windows 8 platform. Continue reading for our Toshiba Satellite P855-32G Review. 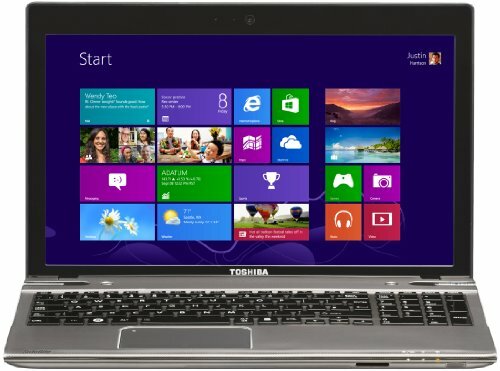 Below is our review of the Toshiba Satellite P855-32G, a 15.6" laptop, featuring 8GB RAM, 1TB hard drive and Windows 8. If you're looking to purchase a high end laptop, you'd expect an attractive and expensive casing as well as increased performance, over a cheaper model, and this is what Toshiba have strived to achieve in their latest addition to the Satellite range with the release of the P855-32G. The exterior is manufactured out of aluminium - in a colour scheme they have extravagantly labelled as being "Precious Silver". Precious or not, to our relative untrained eyes (in colour schemes at least) it appears to be a matte silver metallic colour, and overall it looks and feels solid, as well as stylish. The interior follows suit, with a similar metal construction surrounding the keyboard and touch pad - overall we were impressed with the design and construction of this notebook. The keyboard itself is finished in black, and with generously sized and spaced keys, it is comfortable to type on. The addition of a number pad helps add a degree of practicality for those who wish to use this laptop for business purposes as well. The touch pad is located approximately a third of the way across the laptop, situated on the left hand side. It offered, as per the rest of Toshiba's range, a good level of accuracy over proceedings on the notebook, with none of our testers finding any issues. Inside the notebook you'll find the Intel Core i5-3210M processor, operating at 2.5/3.1GHz, and providing increased efficiency via Intel's Hyper Threading as well as Turbo Boost technology, thus helping to improve overall battery life. This is backed up with a solid 8GB RAM, and a 2GB NVIDIA GeForce GT 630M Graphics card. This helped to keep the laptop running at an impressive speed, with Windows loading fast and running well. Storage is catered for by an impressive 1TB hard drive operating at 5400rpm, leaving you plenty of room for your media collection. The 15.6" display has a maximum resolution of 2048 pixels by 1536 pixels, with a maximum refresh rate of 100Hz. You can also output the picture to an external monitor via the HDMI or VGA ports. Other connections supplied include an RJ45 Ethernet, headphones, microphone, a multi card reader, and 4 x USB 3.0 ports. Weight was around the 2.66kg mark, and overall dimensions were 38.5cm by 25.2cm by between 2.7cm and 3.1cm in thickness - so not the smallest and lightest out there. Overall what did we make of the Toshiba Satellite P855-32G? Decent specification, looks great and runs fast. A touch on the heavy side - aisdes from that no complaints. Overall this is a great looking laptop that performs well and offers a decent specification for the price tag. The weight is a very slight issue, but only if we were being very picky. Well worth taking a look at if you're in the market for a £600ish laptop.